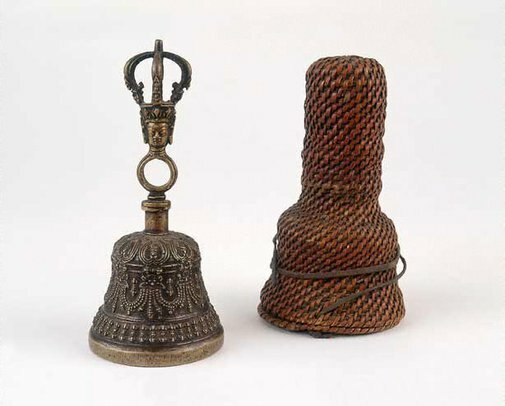 The bell and thunderbolt (Tibetan: 'dorje'; Sanskrit: 'vajra') are the two most important instruments in Tibetan Tantric (Vajrayana) Buddhist ritual. The 'dorje' (thunderbolt) represents the idea of skill and is thought of as masculine in Tibetan Buddhism. The bell is regarded as feminine and represents supreme wisdom. Here, the bell's handle combines half a thunderbolt shape and the head of the goddess Prajna, who represents wisdom. The top of the bell is inscribed with the petals of a lotus and the body is decorated with a design of jewel-spitting heads called 'kala' (time). A band of thunderbolts at the bottom of the bell completes the design.